Lets look at what was added and modified. Please remember to Merge – Append when installing the package if you are upgrading. >> Quartz.Net was upgraded from 2.5.0 to 2.6.2, please verify your deployment processes appropriately. >> Ability to run a Sitecore Commerce Minion on a SiteCron schedule! Yeap, here it is. In order for you to do this please include Konabos.Minions.RunMinion.dll in your Commerce engine deployment. This will exposes methods in the Proxy which will let you execute a Commerce Minion. 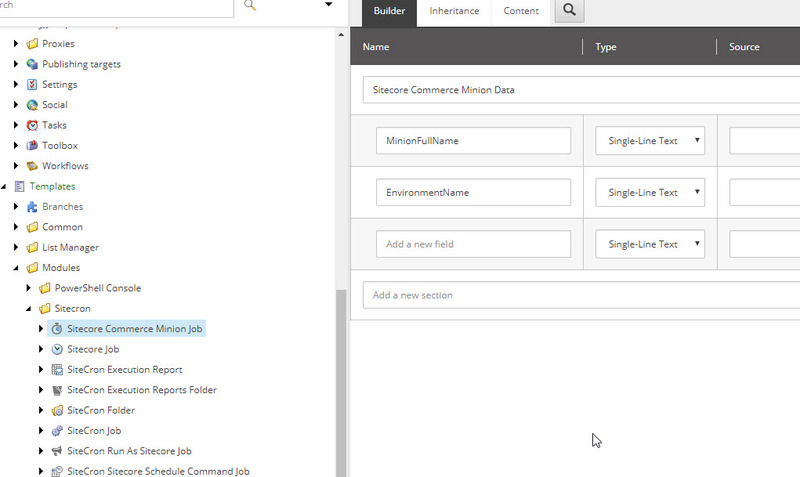 An example of a RunMinionNow job is in Sitecron.Jobs.Commerce.RunMinionNow. 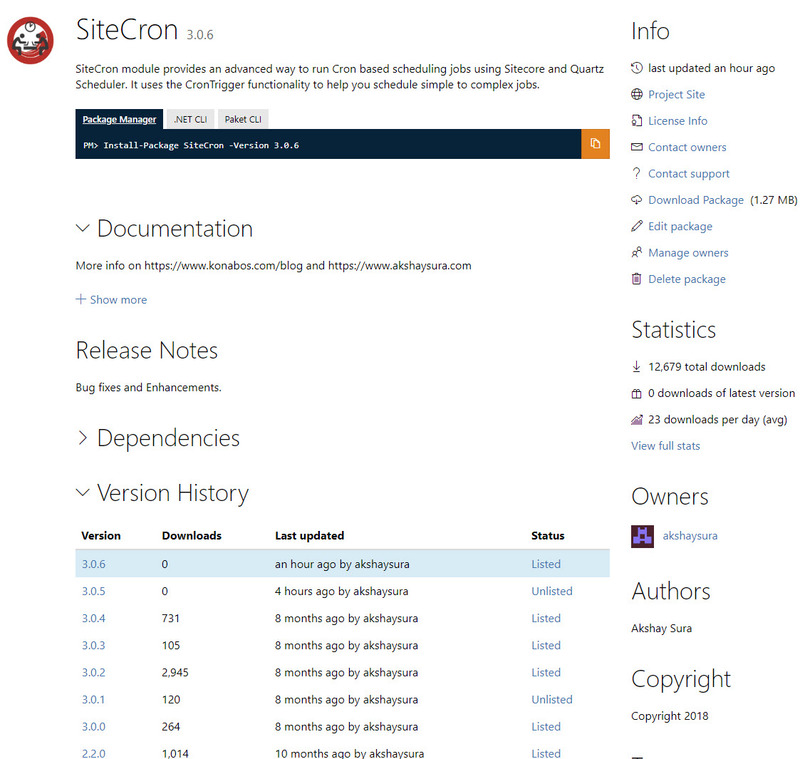 >> SiteCron.aspx page in the admin part of Sitecore. I have a basic page which shows you all the jobs that are recognized by SiteCron. 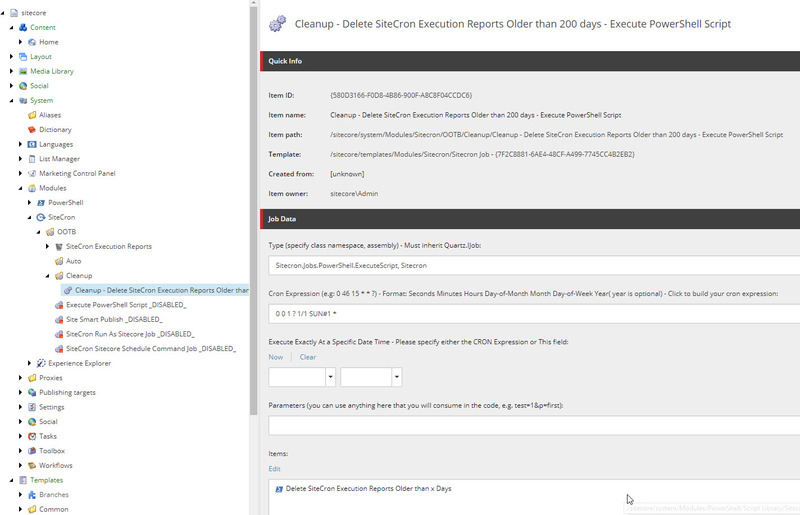 Navigate to /sitecore/admin/sitecron.aspx to see the new page. >> Modified the Database Job Provider to use the content search rather than Axes.GetDescendants. >> Added a restriction to show Execute Now only on the Publishing instance, if one is configured. >> Added a setting to specify the TemplateId’s of valid SiteCron job templates in the SiteCron.config file. >> Added a setting to specify the index name to be used for loading SiteCron jobs. >> Modified SiteCronJobs.config to add extra parameters to include Commerce Minion job attributes. >> Added a clean up agent schedule job which runs at 1AM on the first Sunday of the month. Currently the deletion is taking about 90 seconds for 3000 items. The Bucket Sync takes quite a bit of time depending on the size of your Execution report item bucket. The script is disabled by default. Please turn it on if you need it. The script is shown below. It deletes all Execution reports older than 200 days. $sitecronExecutionLog = "Scheduled Job to delete older SiteCron Execution Reports - Older than $dateOlder - Older than $noOfDays days! `n"
$sitecronExecutionLog += (Get-date).ToString() + "Syncing item bucket"
$bucketItem = Get-Item -Path "master:sitecoresystemModulesSitecronOOTBSiteCron Execution Reports"
$sitecronExecutionLog += (Get-date).ToString() + "Done!" Credit to Ben for suggesting the cleanup agent. Credit to Michael for helping me with the cleanup agent Powershell script.